Greg R opened the meeting at the Lake Mills EMS building at 12:20pm and led the group in the Pledge of Allegiance followed with the Four-Way Test. Jim W. brought up observations of overserved individuals. They were rude and aggressive. Pours got heavier throughout the night. We need to curb this next year to maintain a great event. UW Whitewater Center for Communicative Disorders spoke on speech and language pathology, specifically aphasia. Many people who develop aphasia still have full cognition, but cannot put words to their thoughts. Therapists help them with coping strategies, like singing the words since it uses a different part of the brain. The UW-W Center provides services at low or no cost, and utilizes students in the graduate program to help deliver patient care. Please tell us about yourself (i.e. number of brothers/sisters, hobbies, interests, etc.). I am currently a senior at Lake Mills High School. My family includes a younger sister, a sophomore at the high school, my mom, Jenny, and my father, Kyle. Things I like to do in my free time include playing sports, specifically baseball, and spending time with my friends and family. I spend anywhere from 14 to 21 hours a week practicing and playing baseball, all while balancing the many responsibilities of school. I play for both the high school and my summer travel team, Thundercats Sports Academy. My travel team travels around the midwest all summer and fall competing in high level tournaments. Outside of baseball, the majority of my time is consumed by my education. I take my education very seriously and work very hard to achieve the things I do. This year my class schedule includes classes like AP Calc, Physics, French 5, and Biotechnology and Forensic Science. I am particularly fond of math and science, and I always have been. Please list all extra-curricular and co-curricular activities that you have been involved with in the past and plan to be involved in this year. List all offices and the year of participation (9, 10, 11, & 12). The extra-curricular activities that I’m involved in include playing baseball (grades 9 through 12), National Honor Society (grades 11 and 12), playing soccer (grades 9 through 11), band (grades 9 through 11), french club (grades 9 through 12), and teaching youth baseball lessons (grade 12). As for co-curricular activities, I was accepted as a link leader my senior year and we trained for that this summer. Please list specific examples of your community involvement and community service (i.e. 4-H, scouting, church activities). I have been involved in community service throughout my time in high school. Throughout my freshman and sophomore year I volunteered at the indoor facility of Thundercats Sports Academy, my summer travel baseball team. I accumulated 200 plus service hours over the two years there. I completed tasks such as cleaning, organizing, desk work, and even helping coach some 9 and 10 year old practices. Every year the high school baseball team runs youth camps in the early spring. That usually comes to a sum of about 10 hours each year. The high school soccer team does the same thing in August every year. I also volunteer at the school store, The Paw. I work as the cashier during a couple of the junior varsity basketball games. I do plan on accumulating more service hours as I still spend plentiful time at the Thundercats indoor facility, and I’m a member of Lake Mills National Honor Society which requires 10 service hours a semester. After high school I plan to study BioPhysics and play baseball at the University of Wisconsin-La Crosse. After I complete my undergraduate degree in Biophysics, I plan on pursuing a master’s degree in BioMedical Engineering. My hope is to find an occupation dealing with various types of prosthetics. During my time at high school I’ve really enjoyed both science and math at all levels, and I’ve always kind of known that I wanted to pursue a career in engineering. I was unsure about what kind of engineering until pretty recently. I came across BioMedical Engineering and prosthetics and found it particularly interesting because it includes a lot of what I’ve found to be fascinating throughout high school. Not only does it include subjects like science and math, but also being able to do hands on work, working with people, and there’s a possibility of being able to keep a connection to my passion for athletics as I could potentially be assisting marathon runners or other types of athletes as they make an effort to compete again. Why do you want to be selected as a Student Rotarian? I would like to be Student Rotarian for a couple of reasons. The first is that I think it would be a great opportunity to network and meet new people. Along with meeting new people is hearing different points of view on various topics and subjects. I think I would really enjoy talking to others and listening to the guest speakers to hear what they have to say and just become more knowledgeable on whatever the topic is for the day or conversation. The second reason is to get to know the community better. I haven’t been able to get to know the community all that well because I haven’t always gone to Lake Mills for school, I used to go to Johnson Creek schools so I’ve just always lacked some knowledge about the community. Getting to know more about the Lake Mills community would just make the last four years even more memorable. Hello, my name is Ashli Patrick. My parents are Dawn and Chad Patrick and I have two younger brothers named Logan, who is 13 years old, and Tyler, who is 11 years old. I enjoy playing my ukulele, curling up with a good book and hot tea, and watching Disney movies with my family. On the weekends you can frequently find me at a soccer field with my club team, where I have been the team captain for two years. During the school year, I play soccer, tennis, and manage the boys basketball team. I have been on both the tennis and soccer varsity teams for all four years, and have managed for three. This year I am serving as captain of the tennis team and hope to do the same for soccer in the spring. I have been a part of the school musicals for four years as well, and this year will be my third year in show choir. Some clubs I am a part of through all four year of school include Spanish club, Junior Optimist club, and Drama club. I have been in National Honor Society and Tri M for two years, and this year I am on Link Crew. While I have not held an office in any of these clubs thus far, I am an active member and plan to run for secretary of the Spanish club for my senior year. I also held the office of secretary of Women’s choir my sophomore year. Some ways I try to give back to my community include coaching two youth soccer teams in the fall and spring. In addition, after spending a week as a delegate of the American Legion Auxiliary Badger Girls State, I have decided to become a Junior Member of the Auxiliary. In my four years of high school I have also dedicated my Sundays to helping lead a group in Sunday School at my church. Immediately after graduating, I plan to return to Badger Girls State, this time as a Junior Counselor. In the fall of 2019 I hope to attend UW-La Crosse and study athletic training. In my time at La Crosse I hope to participate in the Disney College Program for a semester. 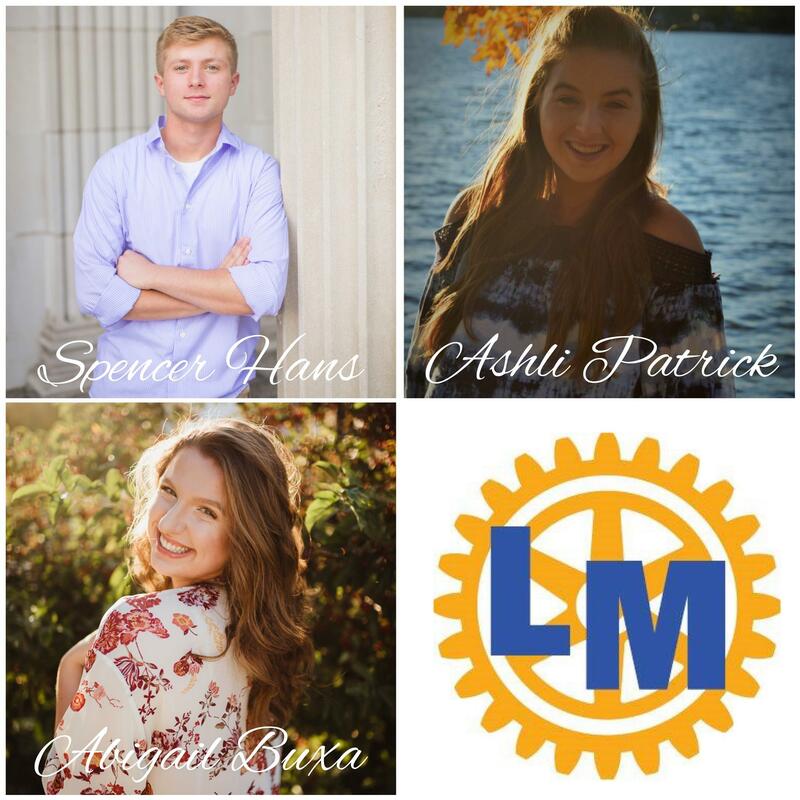 I would love to be a Student Rotarian because I feel that would validate all of my hard work and dedication throughout my time at Lake Mills High School. I would feel honored to learn more about leadership from these esteemed members of our community, seeing as they have so much to offer and teach. My name is Abigail Buxa, and I am a senior at Lakside Lutheran High School. I live with my parents and my younger siblings, Lydia (16) and Ben (14). My dad was a Coast Guard pilot, so I have lived in Alaska, Washington D.C., California, and now Wisconsin. I love painting, and I even started my own calligraphy business—Signs from Above by Abigail. I also enjoy photography and traveling. During my time at Lakeside, I have participated in volleyball (9-10), basketball (9-12), and track & field (9-12). I am the president of Operation GO and National Honor Society. I also am a part of the newspaper and yearbook staff, Teens for Christ, SWELL (Society of Women Engineers and Lakeside Lutheran), the math team, and A Cappella choir. I have also participated in WSMA Solo/Ensemble events, placing 1st at State for Piano Solo, as well as the Capitol Conference Art Show, receiving awards for Best of School and 2nd Place Best of Show. I am valedictorian, National Merit Commended student, and was a Badger Girls’ State representative last summer. My parents have always emphasized serving others and serving Jesus, so I have been involved in a lot of community service. I have volunteered at People Against Sexual and Domestic Abuse (PADA), Twice is Nice, Hope Church as a Kids Connect assistant, Ruby’s Pantry, Lakeside Lutheran Grand Event, Honor Flight, Soles for Jesus, and various grade school volleyball and basketball tournaments. After I graduate, I hope to attend Lipscomb University in Nashville, Tennessee. I plan to major in applied mathematics and add a major/minor in psychology, art, business, or Spanish. I'm thankful to be nominated student Rotarian because I love serving others and I appreciate Rotary’s emphasis on “service over self.” It also inspires me to meet ambitious, motivated, accomplished people, so I am incredibly excited and blessed to receive this opportunity!